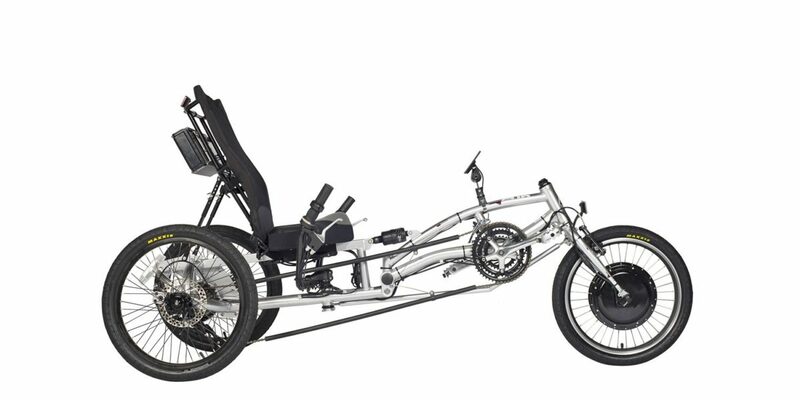 Maxxis Hookworm, 20" x 1.95"
The Sun Seeker EZ-3 HD is a “heavy duty” stand alone recumbent Delta trike. 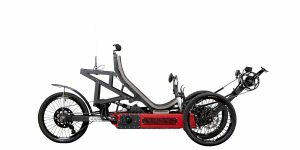 That is, a three-wheeled bicycle with two wheels in the back Delta style that can accommodate up to 400 lbs of passenger weight… and most of the weight will likely be coming from the rider because there aren’t any racks and the add-on battery pack that Electric Bike Technologies added is taking up most of the seat back support arms. There are two bottle cage bosses here but they are covered up on this model. 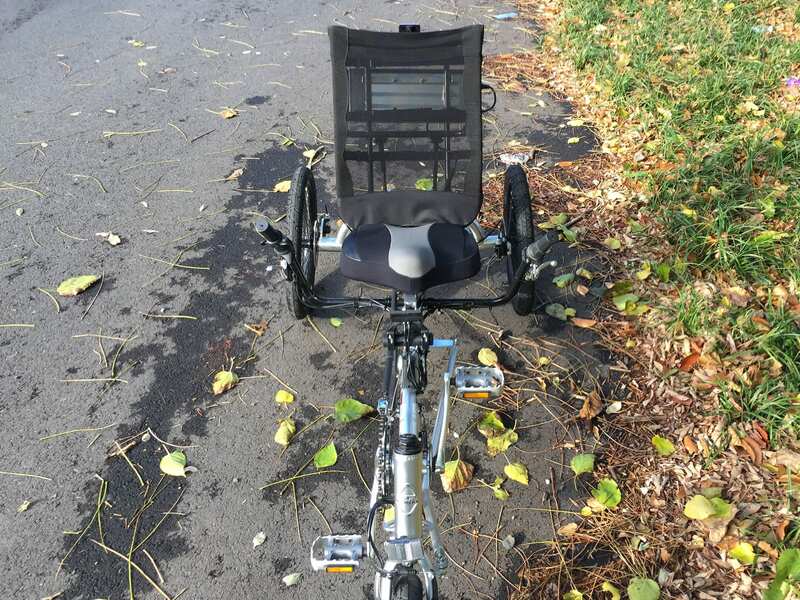 So why not have two wheels in the front and a rack in the rear? 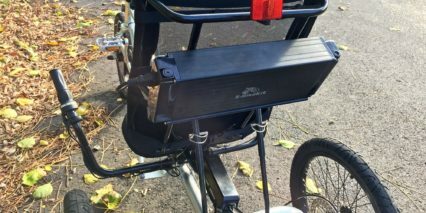 Why not mount the battery somewhere else? 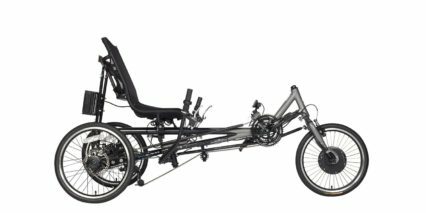 This design is much easier to stand over and sit down on than most Tadpole style trikes (those with two wheels up front). As for the battery, I believe this was just the best option for accessibility given that it’s easier to plug into and even remove from this spot. 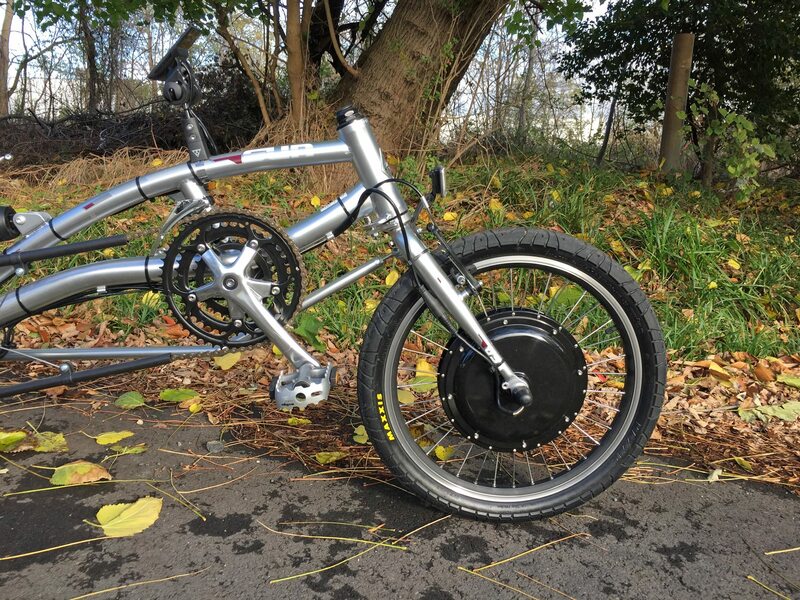 All in all, I’d call this an average electric bike, one that has some real trade-offs to consider in design (uncomfortable throttle placement, basic suspension, generic brakes) but keeps the price low and makes it possible for a different audience to engage. If you’re a heavier person, this is one of the few e-trikes available at all and it’s sportier and more bicycle-like than the Worksman Cycles PAV3 (also converted by Electric Bike Technologies). One thing that I really love about it is how adjustable the control settings are and how open the battery and controller are to being upgraded or replaced by third-party options. 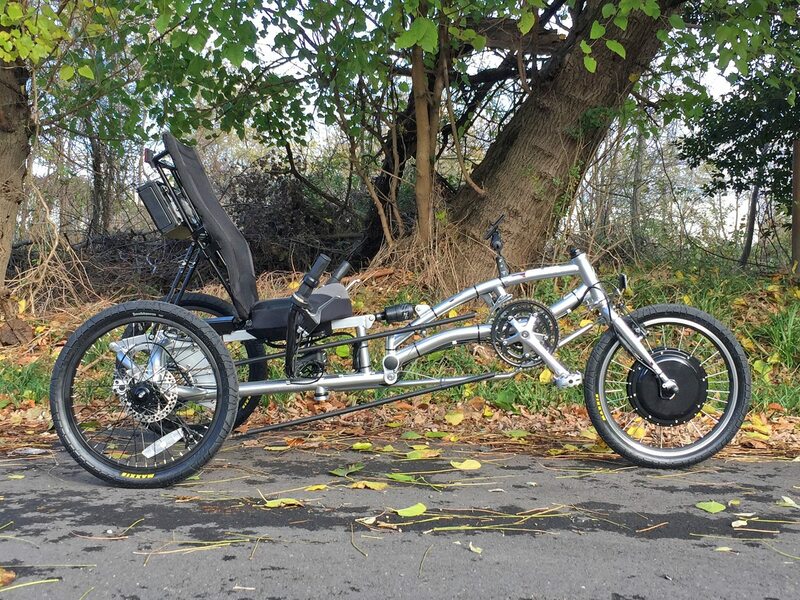 Driving the trike is an impressive 500 watt gearless hub motor mounted into the front wheel. 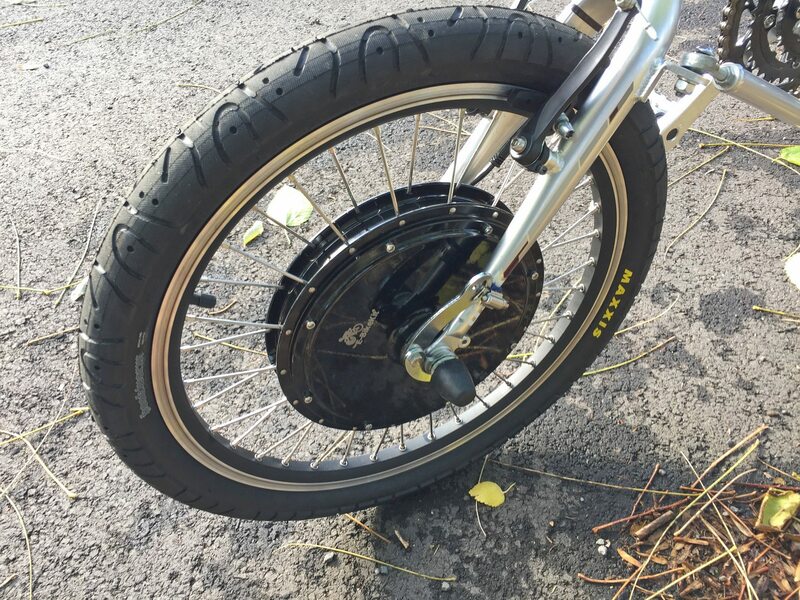 The side effects of having such a large and powerful motor are that it can move the heavier frame and rider… but also takes more work to steer and may spin out. 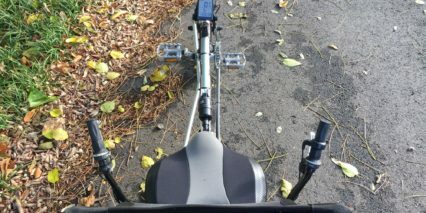 Perhaps the settings on my demo bike were mellowed out however because it did not feel especially zippy. Smoother acceleration saves power and is more predictable so that’s not a bad thing. 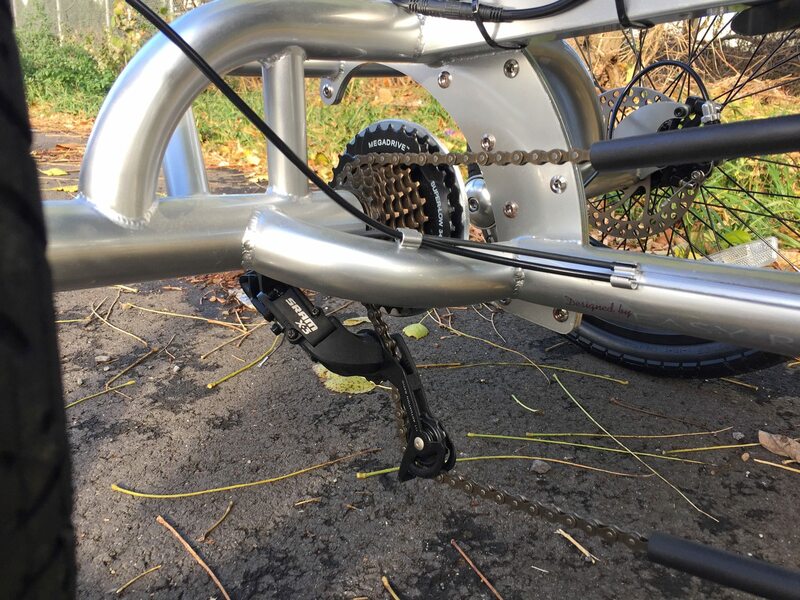 I noticed the extra-large torque arm connecting the motor axle to the fork arm and was impressed by how quiet it performed. 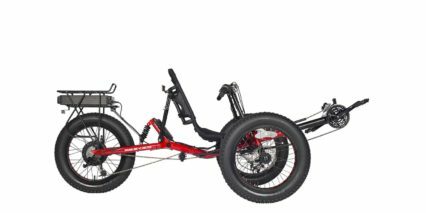 For those who live in hilly areas (even medium weight riders), do not expect this trike to carry you up hills without helping. 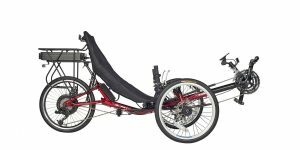 The motor performs best when you gather some speed going in and if you help out by pedaling. 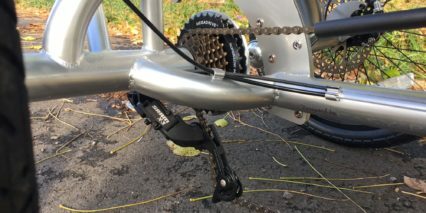 And since you’ve got 21 gears to work with, pedaling is comfortable and a wide range of speeds. There’s even an extra large ring specifically for climbing in the rear cluster. 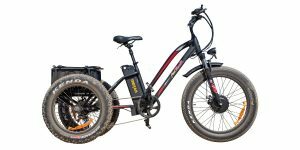 Powering the bike is a 48 volt 10.5 amp hour Lithium-ion battery with lightweight long lasting characteristics. The cells are contained in an Aluminum box with plastic end caps and the top has a handle making it easy to carry. I’m not thrilled with how and where it’s mounted but I can’t think of a better option without some custom designed platform mount which would likely increase the price. 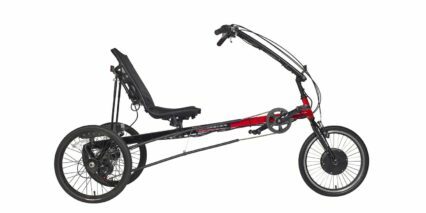 During my rides it worked well and was actually easier to take off than some of the in-basket designes on other trikes. 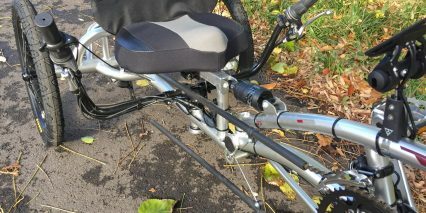 The key is required to unlock and remove the pack (which slides off the left side of the seat rails) as well as to operate it. You insert the key, turn it all the way to on and then press the M button on the button pad control ring. This is something I love to gripe about because the key can jingle when riding if you’ve got a keychain connected… or even snag. 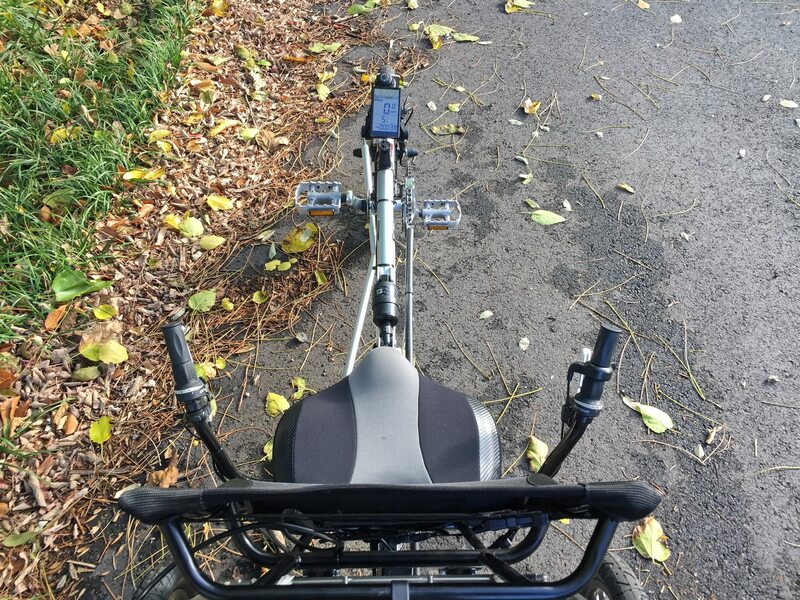 Thankfully, at least inthe case of the Sun Seeker EZ-3 HD, the key is behind you and very clear of feet and arm movement while riding. 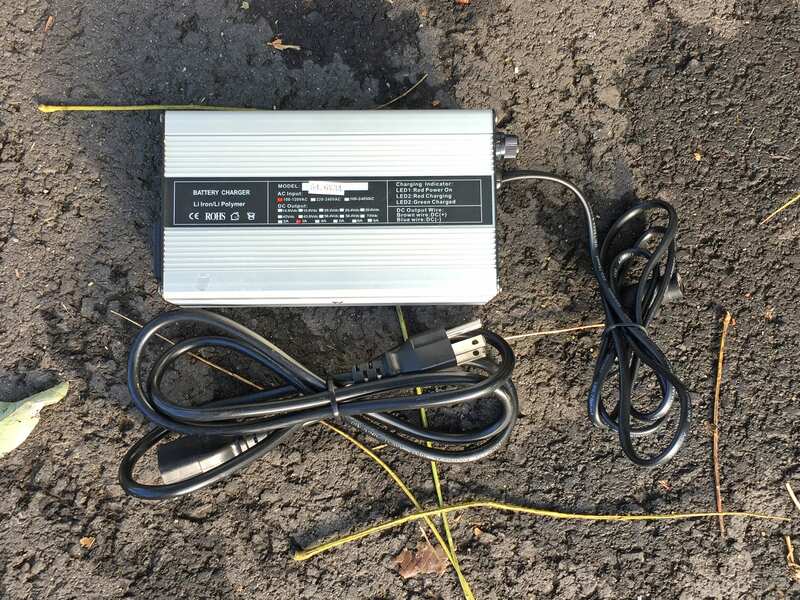 Note that the battery charger resembles the battery itself, having an Aluminum case. It’s relatively light and compact but might still be difficult to cart along without some sort of custom bag solution. 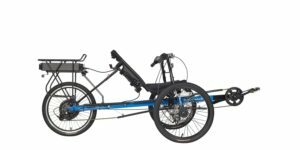 I often wear a backpack on the front of my body when testing trikes like this but that limits airflow… Perhaps a little trailer would do? 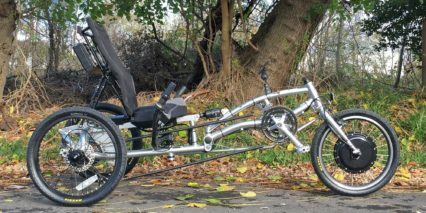 Operating the trike is fun and interesting once they key is inserted and turned to “on” because you get lots of options and adjustments. Whether you want to limit the top speed, disable the throttle or pedal assist or adjust the Amp output (for smoother riding). 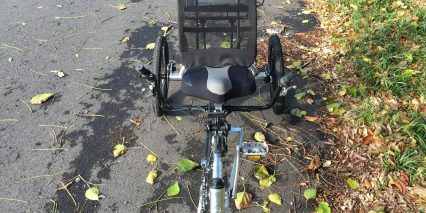 Even adjust how quickly pedal assist responds! 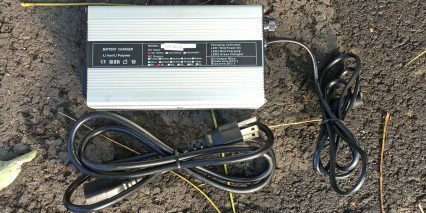 It’s all doable here and I was told that the controller was setup with a custom power curve to match the battery pack for improved power drain accuracy. 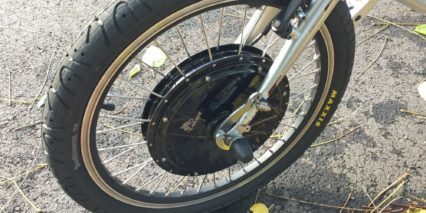 This is a great update considering some of the older batteries and displays used by Electric Bike Technologies were just basic LED readouts using sensitive Lead Acid batteries. In short, this trike is more open to adjustment which results in less complex unwanted behavior, slower riding for people with balance challenges and extended range for those who are willing to sacrifice the feelign of zippiness. The display itself is beautiful, very thin but large and easy to read. 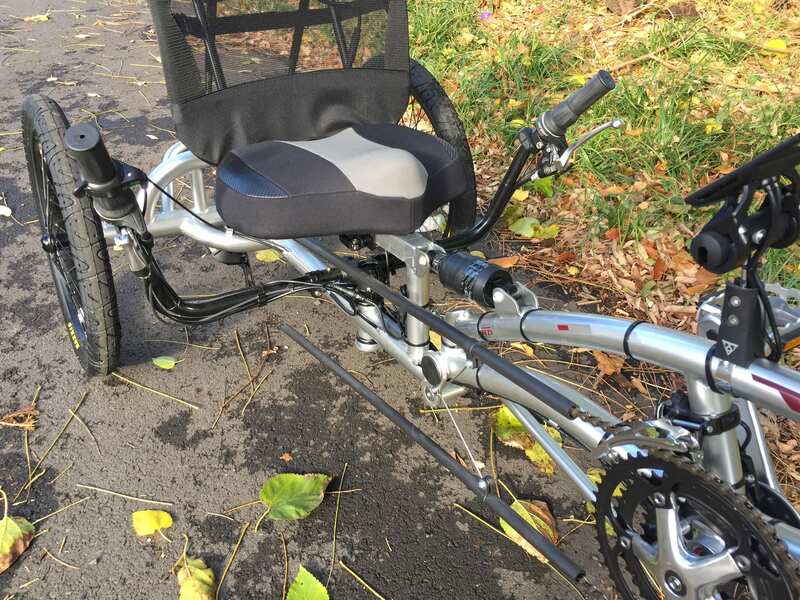 It’s adjustable forward and back, to reduce glare, but is not removable. This concerned me a little given how nice it looks… consider draping a shirt over it or something when parking to deter unwanted attention? 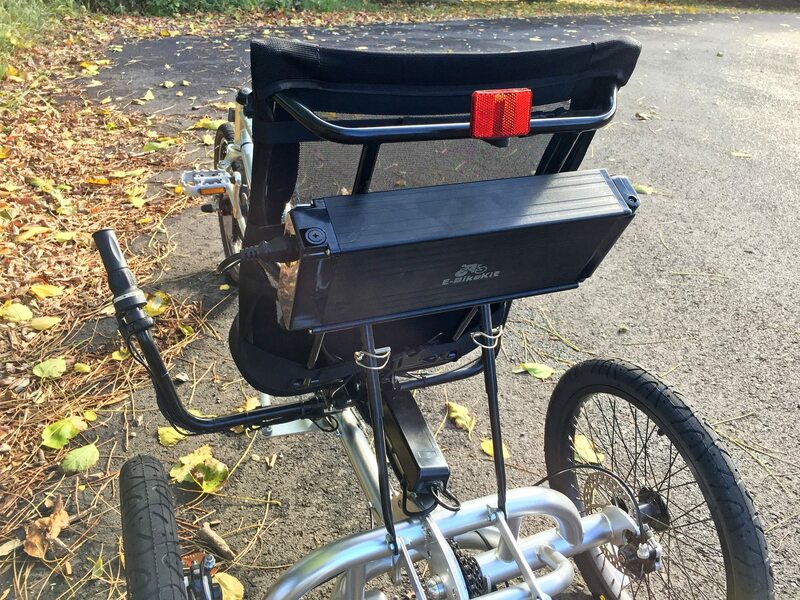 I noticed that the wires from the display, motor, battery and controller were professionall gathered and strung along the frame and love that both brake levers have motor inhibitors built in (to cut power to the ebike systems the instant you pull them) and there’s a parking brake latch system to keep the trike from rolling away when you leave it. At 99 lbs this trike can be a handful and there’s a $350 charge for shipping unless you can drive to Pennsylvania and pick it up. The team making these is US based, does a lot of hands on work to get products setup before delivery and you should be greeted by a large box with a product that is “ready to ride” as soon as you open and unpack it. 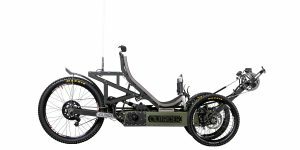 While I love the idea of suspension, I feel that the larger tires, padded seat and upright body position all contribute equally to the comfort felt with the EZ-3. 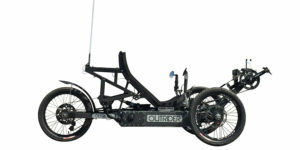 The suspension bumper itself offers limited travel and very limited adjustability. 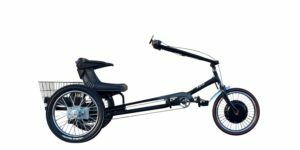 I’m not a super large rider myself and might steer towards another trike from ElectricTrike.com but completely appreciate that this one exists. 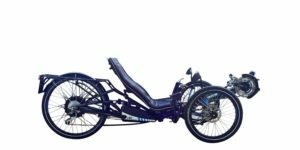 It could be a real life changer for someone who hasn’t ridden bikes for a while and doesn’t have the flexibility, balance or endurance to ride with others but who still wants to go along (or maybe replace their car for short trips). Yes, I’m bummed about the limited storage but that can be overcome… just like the lack of lights and flag. 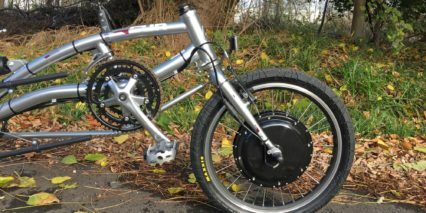 Depending on where you live, with a bit of creativity this could turn into an awesome platform and be a joy to ride.